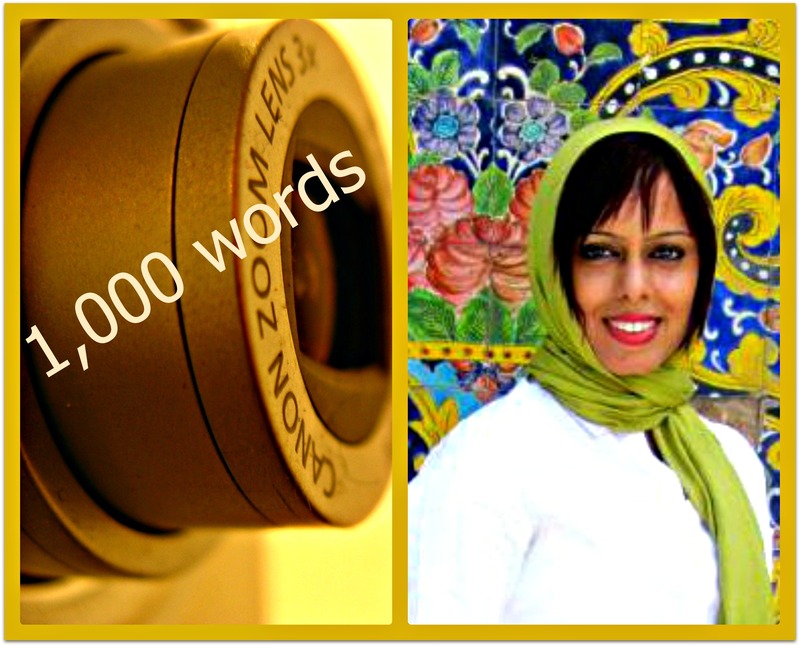 Canon zoom lens, photo credit: Morguefiles; portrait of Svetlana Baghawan taken at Golestan Palace, Tehran, Iran. Born and raised in India, Svetlana is a mother and writer as well traveller. She also describes herself as a compulsive shopper, foodie, bad cook (her words) and animal lover. She likes to travel solo across continents, sometimes completely alone, often with her five-year-old daughter in tow. Having worked as a flight attendant for quite a few years, she was bitten by the travel bug early, and for good. By the time I left Tehran, I was a far cry from the shaky, nervous girl who had landed there two weeks before. The photo (above) was taken by the Tehran moral policeman who pulled me up for wearing tight jeans. When I told him I was from India, he revealed a fascination for Bollywood and I glibly lied about being a professional Bollywood dancer. He happily let me go after taking this photo and a few others. Not only did my response save me from harassment but I’d surprised myself with my new-found confidence. It was a turning point in my life. That’s why I love the photo. Welcome to the Displaced Nation, Svetlana. I have been looking forward to discussing your photo-travel experiences ever since I discovered your blog, Maverickbird, some months ago. The first thing that caught my eye was the unusual title which, as I now know, describes you perfectly. Let’s start with where you were born. And when you spread your wings (an apt metaphor in your case!) to start travelling? I was born in Calcutta, India, and spread my wings at the age of 17 when I was selected as a flight attendant by an international airline. I think I can put you in the seasoned traveller category now as you have been travelling for work and pleasure for 16 years. Tell us, what is it like to be a solo female traveller? My travels could be described as falling into three categories. Initially they were only what I would call city centric and absolutely touristy. You know, the places where flight crews get night halts and have limited time to relax. So there is little else to do except take selfies, shop, eat and sleep. Then came the phase when I travelled with my family, which, apart from the touristy fun bit, also involved taking on a lot of responsibilities. Then finally, at the age of 30, I started traveling solo. Since then my journeys have been challenging but also more fulfilling and enriching. So at last you are, how shall I say, awakened perhaps? And living a dream. I can appreciate how uplifting that must be so I would love to know what inspired you to travel and what countries you have visited? It may sound a bit melodramatic, but one day I was happily tied to my role of the traditional Indian married lady, and the next I was suddenly alone: a blow was dealt to my secure little world. I struggled to come to terms with my loss, but grief and depression, coupled with the suffocating social taboos that are dumped on bereaved ladies in India, nearly drove me over the edge. I was still a flight attendant at the time so used my free airline ticket facility and took off. I craved an escape. It was my way to survive. Iran was my first stop. It was tough—but soul touching and completely healing. I returned from Iran with a new-found zest for life, secure in my own identity and confident to take on the world once again. How many countries in all have you visited? If I include all the places which I have visited since I started flying then the list would run to nearly 60 countries. As a solo traveller, I have visited and engaged with 13 countries in depth. Recovering from a tragedy takes courage, and the fact that you didn’t dwell on your loss for too long shows your resilience. I firmly believe that we learn more from adversity than we do from triumph or success. You have good reason to be proud. So where are you now, how did you end up there and what is life like in a new place? I am in Sri Lanka where I came to help a friend on a whaling project. I have found Sri Lanka to be very unsettling and unexpectedly tough to handle especially for a single woman of Indian origin. Although it’s a breathtakingly beautiful country with amazing people, culture and history, I have a sense of “alien familiarity” here, which I’m finding difficult to handle. It’s similar to home yet so very different. I am constantly oscillating between feeling at home and being displaced. Sri Lankans only seem to be able to associate with Southern India—hence the dazed reactions of nearly everybody I meet to my descriptions of Calcutta. This is slowing wearing me out. A whaling project sounds pretty exciting—I hope you don’t let the other issues get you down. Let’s have a look now at some photos that capture a few of your favourite memories and hear your stories about what makes these memories so special. Singing a gorgeous blues in the Himalayas; photo credit: Svetlana Baghawan. 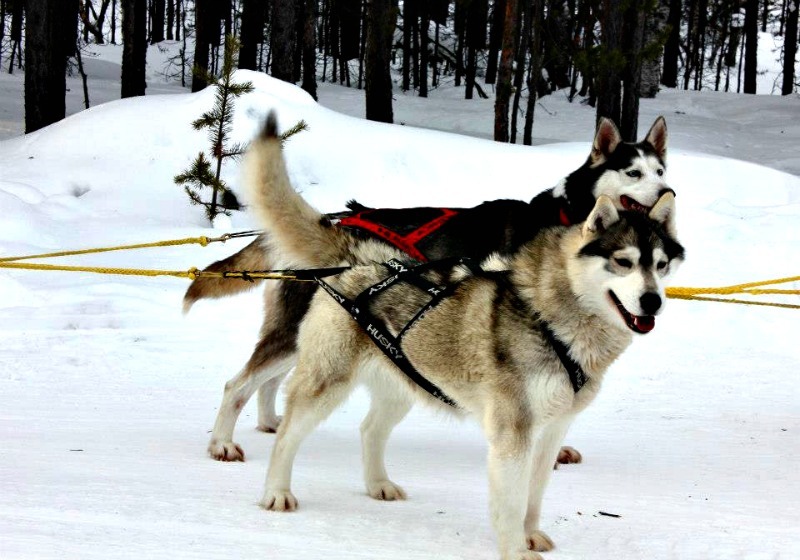 Meeting huskies in Lovozero, a village in Northern Russia, was a dream come true for me. Their puppy love floored me completely. It was extremely heart-warming to see the way those tough little dogs did the usual doggy tricks, like yapping away in happiness on being taken out for a run, making cute puppy eyes to get their way and cuddling on one’s lap like big babies. Floored by puppy love in Northern Russia; photo credit: Svetlana Baghawan. 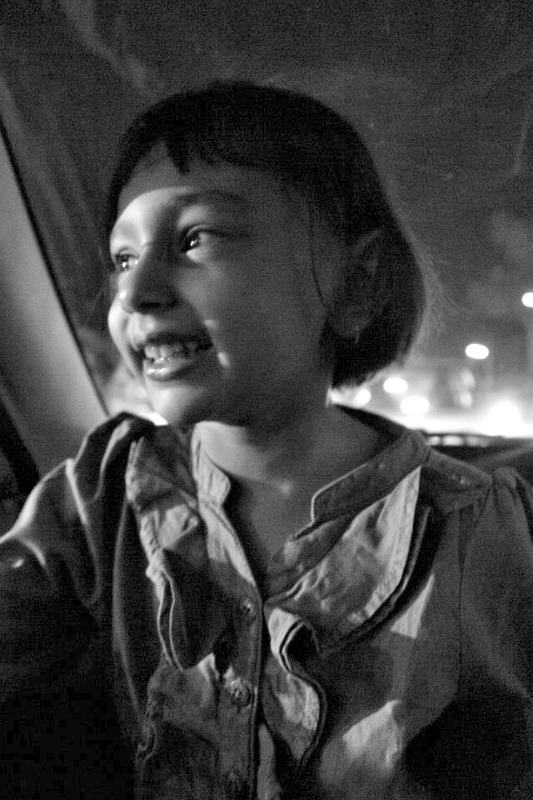 A daughter’s delight in Diwali; photo credit: Svetlana Baghawan. Diwali, for those who don’t know, is the biggest festival celebrated in India. Held around November, it signifies the victory of good over evil and is celebrated with a lot of festivities: spring cleaning, new clothes, home makeovers, auspicious purchases of substantial things like gold, cars, house etc, starting of new ventures, exchanging gifts, sweets and finally with lots of lights and fireworks. The whole country gets lit up in millions of lights as every Indian irrespective of caste, religion and social standing, decorates their house with lamps/lights. This is a beautiful photo which captures a child’s joy and innocence. I can see she is very precious to you. Tell us, where were (or are) your favourite places to take photographs? Shiraz, Iran, is a favourite of mine because of its stunning landscape, spectacular architecture, feast of archaeological wonders, and photogenic people who are also genuinely friendly. I loved the playful rainbows created inside this mosque. To me it truly represented Iran, which I have found to be a friendly, delightful and safe country. Unfortunately, it is shrouded under an unfortunate pall of cruel myths. 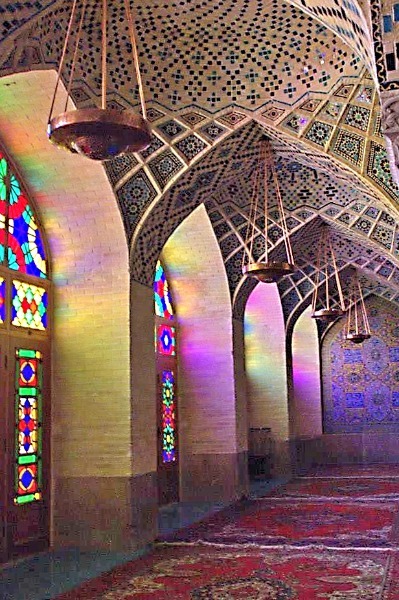 Somewhere over the rainbow…is this gem of an Iranian mosque; photo credit: Svetlana Baghawan. How interesting and not the general Western perception of the place, I’m sure. Siberia would be another favourite place to photograph. The sheer amount of unexplored open natural beauty is very freeing and of course the landscape is breathtaking. 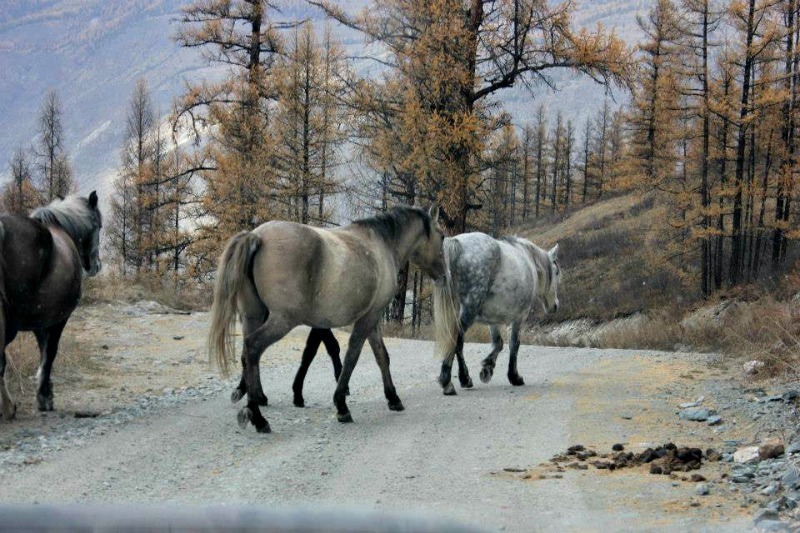 These wild Altai horses say Siberia to me, with its staggeringly expansive land mass and incredible, wild beauty. Wild horses in the wilds of Siberia’s Atlai mountains; photo credit: Svetlana Baghawan. 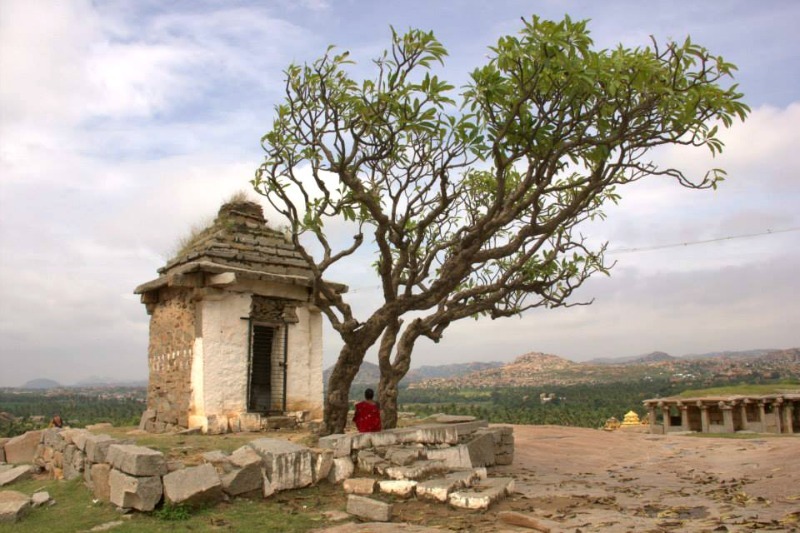 Last but not the least would be Hampi, a village in Karnataka, a state in South West India, famed for being located within the ruins of Vijayanagara, an empire that came to prominence at the end of the 13th century. Although it was tough to decide between Hampi and Kashmir, I love Hampi more for its surreal mix of a tangible ghostly civilization lying scattered amidst one of the most beautiful landscapes in India (think balancing boulder, rice fields, forests and obscure rivers) and little pockets of villages. The enchanting blend of the dead and living is breath-taking and the last photo represents Hampi’s larger-than-life beauty. You have to see it to believe it. Contemplating the former glory of a ruined empire (Hampi, India); photo credit: Svetlana Baghawan. I believe you (I doubt I will ever get the opportunity to see it!). You have clearly been touched by the places you’ve visited, which should be an inspiration to other wannabe solo travellers. I’d like to know if you feel reserved about taking photos of people, particularly when they are conscious that you are doing so? I love to take people’s photographs but at times do feel a bit conscious about photographing elderly people. This stems from the fact that they belong to a completely different era and might not at all like the idea of getting clicked. Photographing members of the religious fraternity, like monks, also makes me a bit nervous. I almost always ask permission before taking a person’s photo and in case of a language difference, bow, smile, greet and point to my camera to seek permission. I would like to think so because I see beauty in almost everything and love to capture it to share those moments with others. I believe that looking at the world through rose-tinted glasses is a gift I received from my mother. When I was growing up, she instilled in me a love for life’s beauty in how she would react to the world around us. She would spot a photogenic army of marching ants, play of sun and shade, curls of flower petals, waving strings of lights, etc., and share those moments with me in such an inspiring way. That said, it took me some time to get in touch with this inborn gift. I first realized it in Delhi while photographing a man selling neon-coloured balloons in front of India Gate. The detailed neon glow against the brooding monument in the dark inspired me, and those photos were very well received by my friends and family. Since then, I’ve been alert to beautiful details and while it was once a conscious effort, it is now a seamless habit, one that has made me much happier and contented. Discovering beauty at every step does make the world a less threatening place. Your mother clearly had a great influence on you and especially the way you interact with natural scenery. Moving on to the technical aspects of photography: some of our readers may be curious to hear what kind of camera and lenses you use. I use a Canon 550D although have recently upgraded to 600D and most of the time use 18-200mm lens. I prefer not to use post-processing software, but at times I have tried my hand at Picasa. That’s a coincidence. I have the 600D as well! But unlike you I spend a lot of time learning and using post-processing. I believe, if you have the time, that learning about and improving photographic skills can add enormously to a blog. Having said that, I love at lot of your photo compositions and the subject matter is really good. Finally, do you have any advice for wannabe photographers who are traveling or living abroad? Traveling abroad is both extremely tough and fulfilling at the same time. To leave your comfort zone for unknown territories and cultures is difficult but once you start coming to terms with the culture’s uniqueness, you will fall in love with it. Accepting the way a new place is in a non-judgmental way will help the transition process and slowly reveal its unfamiliar yet unique beauty, which you can photograph. Respect for the local culture comes first. You strike me as living proof of that statement. You have overcome adversity and grown as a person: a true triumph! Readers, what do you make of Svetlana’s experiences and the photos she has produced? Please leave any questions or feedback in the comments! Want to get to know her better? 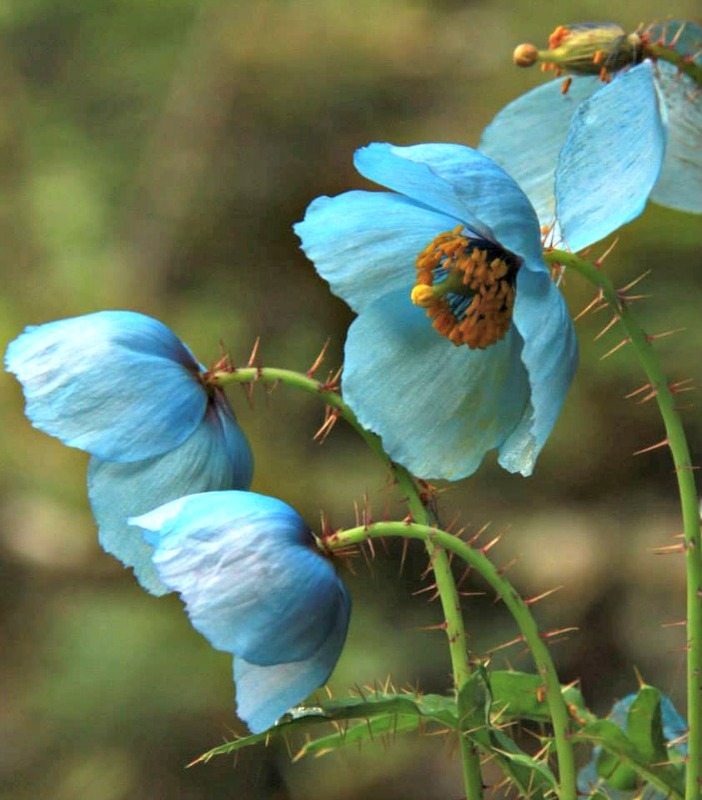 I suggest that you visit Svetlana’s blog, maverickbird. She can be contacted by email. Svetlana, I find your story particularly appropriate for Thanksgiving week here in the United States. Oftentimes, it’s difficult to be grateful for what we’ve got, particularly in the wake of crushing losses in one’s personal life, when it feels like you have a lot less compared to what you used to have and your peers have. From living in England, I know one is supposed to Keep Calm and Carry On, but we should remember that this slogan was created as part of a campaign by the British government to prepare its people for the Second World War. I’ve always thought it much easier to adhere to that principle as a nation facing a common adversary than as an individual facing a difficult circumstance. In the latter situation, you can feel truly alone, especially when, as you say, you feel the weight of societal expectations of how you should respond. I can therefore say I am truly inspired by your example. To find so much beauty and joy in your solo travels–to the point where you’ve embraced life again–gives hope to us all, most particularly to women who suddenly find themselves on their own. As people like to say in this part of the world: you go, girl! Thank you very much for your kind words. Yes at times I feel too old for my age but its been most enriching too. Thanksgiving is incidentally my favourite celebration because of its grateful spirit. Gratitude and love are the most beautiful emotions which can un complicate our lives the most. Dealing with losses, adversities and fighting social expectations (restrictions) had been very challenging but thanks to all the blessings and kindness in my life, I have managed to keep calm and carry on. Thank you once again for your beautiful encouraging words and James King for publishing my story. I am touched.